This is “The Basics of Power”, section 13.1 from the book An Introduction to Organizational Behavior (v. 1.0). For details on it (including licensing), click here. Learn the meaning of power. Understand how power can have both positive and negative consequences. Learn about different sources of power. Understand the relationship between dependency and power. We’ll look at the aspects and nuances of power in more detail in this chapter, but simply put, powerThe ability to influence the behavior of others to get what you want. is the ability to influence the behavior of others to get what you want. Gerald Salancik and Jeffery Pfeffer concur, noting, “Power is simply the ability to get things done the way one wants them to be done.”Salancik, G., & Pfeffer, J. (1989). Who gets power. In M. Thushman, C. O’Reily, & D. Nadler (Eds. ), Management of organizations. New York: Harper & Row. If you want a larger budget to open a new store in a large city and you get the budget increase, you have used your power to influence the decision. Power distribution is usually visible within organizations. For example, Salancik and Pfeffer gathered information from a company with 21 department managers and asked 10 of those department heads to rank all the managers according to the influence each person had in the organization. Although ranking 21 managers might seem like a difficult task, all the managers were immediately able to create that list. When Salancik and Pfeffer compared the rankings, they found virtually no disagreement in how the top 5 and bottom 5 managers were ranked. The only slight differences came from individuals ranking themselves higher than their colleagues ranked them. The same findings held true for factories, banks, and universities. The fact that we can see and succumb to power means that power has both positive and negative consequences. On one hand, powerful CEOs can align an entire organization to move together to achieve goals. Amazing philanthropists such as Paul Farmer, a doctor who brought hospitals, medicine, and doctors to remote Haiti, and Greg Mortenson, a mountaineer who founded the Central Asia Institute and built schools across Pakistan, draw on their own power to organize others toward lofty goals; they have changed the lives of thousands of individuals in countries around the world for the better.Kidder, T. (2004). Mountains beyond mountains: The quest of Dr. Paul Farmer, a man who would cure the world. New York: Random House; Mortenson, G., & Relin, D. O. (2006). Three cups of tea: One man’s mission to promote peace…One school at a time. New York: Viking. On the other hand, autocracy can destroy companies and countries alike. The phrase, “Power tends to corrupt, and absolute power corrupts absolutely” was first said by English historian John Emerich Edward Dalberg, who warned that power was inherently evil and its holders were not to be trusted. History shows that power can be intoxicating and can be devastating when abused, as seen in high-profile cases such as those involving Enron Corporation and government leaders such as the impeached Illinois Governor Rod Blagojevich in 2009. One reason that power can be so easily abused is because individuals are often quick to conform. To understand this relationship better, we will examine three famous researchers who studied conformity in a variety of contexts. ConformityPeople’s tendencies to behave consistently with social norms. refers to people’s tendencies to behave consistently with social norms. Conformity can refer to small things such as how people tend to face forward in an elevator. There’s no rule listed in the elevator saying which way to face, yet it is expected that everyone will face forward. To test this, the next time you’re in an elevator with strangers, simply stand facing the back of the elevator without saying anything. You may notice that those around you become uncomfortable. Conformity can result in engaging in unethical behaviors, because you are led by someone you admire and respect who has power over you. Guards at Abu Ghraib said they were just following orders when they tortured prisoners.CNN.com. (2005, January 15). Graner sentenced to 10 years for abuses. Retrieved November 4, 2008, from http://www.cnn.com/2005/LAW/01/15/graner. court.martial/. People conform because they want to fit in with and please those around them. There is also a tendency to look to others in ambiguous situations, which can lead to conformity. The response to “Why did you do that?” being “Because everyone else was doing it” sums up this tendency. So, does conformity occur only in rare or extreme circumstances? Actually, this is not the case. Three classic sets of studies illustrate how important it is to create checks and balances to help individuals resist the tendency to conform or to abuse authority. To illustrate this, we will examine findings from the Milgram, Asch, and Zimbardo studies. 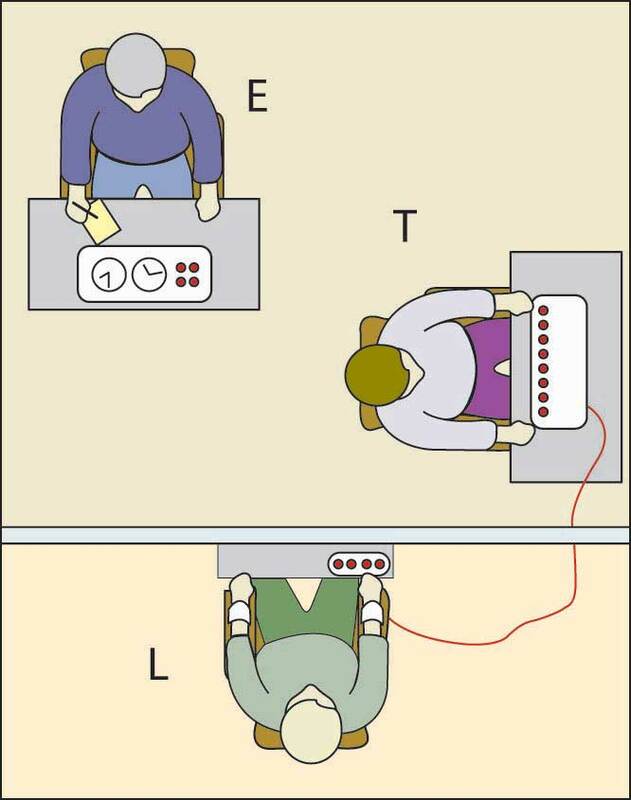 This is an illustration of the setup of a Milgram experiment. The experimenter (E) convinces the subject (“Teacher” T) to give what are believed to be painful electric shocks to another subject, who is actually an actor (“Learner” L). Many subjects continued to give shocks despite pleas of mercy from the actors. Stanley Milgram, a psychologist at Yale in the 1960s, set out to study conformity to authority. His work tested how far individuals would go in hurting another individual when told to do so by a researcher. A key factor in the Milgram study and others that will be discussed is the use of confederates, or people who seem to be participants but are actually paid by the researchers to take on a certain role. Participants believed that they were engaged in an experiment on learning. The participant (teacher) would ask a series of questions to another “participant” (learner). The teachers were instructed to shock the learners whenever an incorrect answer was given. The learner was not a participant at all but actually a confederate who would pretend to be hurt by the shocks and yell out in pain when the button was pushed. Starting at 15 volts of power, the participants were asked to increase the intensity of the shocks over time. Some expressed concern when the voltage was at 135 volts, but few stopped once they were told by the researcher that they would not personally be held responsible for the outcome of the experiment and that their help was needed to complete the experiment. In the end, all the participants were willing to go up to 300 volts, and a shocking 65% were willing to administer the maximum of 450 volts even as they heard screams of pain from the learner.Milgram, S. (1974). Obedience to authority. New York: Harper & Row. Another researcher, Solomon Asch, found that individuals could be influenced to say that two lines were the same length when one was clearly shorter than the other. This effect was established using groups of four or more participants who were told they were in experiments of visual perception. However, only one person in the group was actually in the experiment. The rest were confederates, and the researchers had predetermined whether or not they gave accurate answers. Groups were shown a focal line and a choice of three other lines of varying length, with one being the same length as the focal line. Most of the time the confederates would correctly state which choice matched the focal line, but occasionally they would give an obviously wrong answer. For example, looking at the following lines, the confederates might say that choice C matches the length of the focal line. When this happened, the actual research participant would go along with the wrong answer 37% of the time. When asked why they went along with the group, participants said they assumed that the rest of the group, for whatever reason, had more information regarding the correct choice. It only took three other individuals saying the wrong answer for the participant to routinely agree with the group. However, this effect was decreased by 75% if just one of the insiders gave the correct answer, even if the rest of the group gave the incorrect answer. This finding illustrates the power that even a small dissenting minority can have. Additionally, it holds even if the dissenting confederate gives a different incorrect answer. As long as one confederate gave an answer that was different from the majority, participants were more likely to give the correct answer themselves.Asch, S. E. (1952b). Social psychology. Englewood Cliffs, NJ: Prentice Hall; Asch, S. E. (1956). Studies of independence and conformity. A minority of one against a unanimous majority. Psychological Monographs, 70(9), Whole No. 416. A meta-analysis of 133 studies using Asch’s research design revealed two interesting patterns. First, within the United States, the level of conformity has been decreasing since the 1950s. Second, studies done in collectivistic countries such as Japan showed more conformity than those done in more individualistic countries such as Great Britain.Bond, R., & Smith, P. B. (1996). Culture and conformity: A meta-analysis of studies using Asch’s (1952b, 1956) line judgment task. Psychological Bulletin, 119, 111–137. Participants were asked one by one to say which of the lines on the right matched the line on the focal line on the left. While A is an exact match, many participants conformed when others unanimously chose B or C.
Philip Zimbardo, a researcher at Stanford University, conducted a famous experiment in the 1970s.Zimbardo, P. G. Stanford prison experiment. Retrieved January 30, 2009, from http://www.prisonexp.org/. While this experiment would probably not make it past the human subjects committee of schools today, at the time, he was authorized to place an ad in the paper that asked for male volunteers to help understand prison management. After excluding any volunteers with psychological or medical problems or with any history of crime or drug abuse, he identified 24 volunteers to participate in his study. Researchers randomly assigned 18 individuals to the role of prisoner or guard. Those assigned the role of “prisoners” were surprised when they were picked up by actual police officers and then transferred to a prison that had been created in the basement of the Stanford psychology building. The guards in the experiment were told to keep order but received no training. Zimbardo was shocked with how quickly the expected roles emerged. Prisoners began to feel depressed and helpless. Guards began to be aggressive and abusive. The original experiment was scheduled to last 2 weeks, but Zimbardo ended it after only 6 days upon seeing how deeply entrenched in their roles everyone, including himself, had become. Next we will examine the relationship between dependency and power. DependencyDirectly related to power. The more that a person or unit is dependent on you, the more power you have. is directly related to power. The more that a person or unit is dependent on you, the more power you have. The strategic contingencies model provides a good description of how dependency works. According to the model, dependency is power that a person or unit gains from their ability to handle actual or potential problems facing the organization.Saunders, C. (1990, January). The strategic contingencies theory of power: Multiple perspectives. Journal of Management Studies, 21(1), 1–18. You know how dependent you are on someone when you answer three key questions that are addressed in the following sections. ImportanceThe value of the resource. refers to the value of the resource. The key question here is “How important is this?” If the resources or skills you control are vital to the organization, you will gain some power. The more vital the resources that you control are, the more power you will have. For example, if Kecia is the only person who knows how to fill out reimbursement forms, it is important that you are able to work with her, because getting paid back for business trips and expenses is important to most of us. Finally, substitutabilityOne’s ability to find another option that works as well as the one offered. refers to one’s ability to find another option that works as well as the one offered. The question around whether something is substitutable is “How difficult would it be for me to find another way to this?” The harder it is to find a substitute, the more dependent the person becomes and the more power someone else has over them. If you are the only person who knows how to make a piece of equipment work, you will be very powerful in the organization. This is true unless another piece of equipment is brought in to serve the same function. At that point, your power would diminish. Similarly, countries with large supplies of crude oil have traditionally had power to the extent that other countries need oil to function. As the price of oil climbs, alternative energy sources such as wind, solar, and hydropower become more attractive to investors and governments. For example, in response to soaring fuel costs and environmental concerns, in 2009 Japan Airlines successfully tested a blend of aircraft fuel made from a mix of camelina, jatropha, and algae on the engine of a Boeing 747-300 aircraft.Krauss, C. (2009, January 30). Japan Airlines joins the biofuels race. New York Times. Retrieved January 30, 2009, from http://greeninc.blogs.nytimes.com/2009/01/30/japan-airlines-joins-the-biofuels-race/. 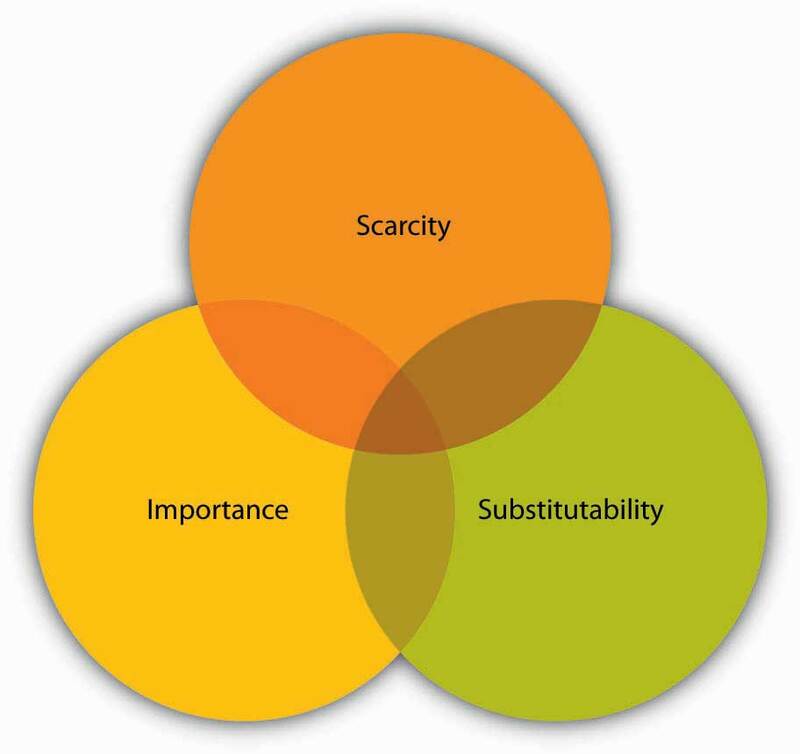 Possessing any of the three aspects of a resource could make others depend on you, two would make you extremely needed, and having all three could make you indispensable. Power is the ability to influence the behavior of others to get what you want. It is often visible to others within organizations. Conformity manifests itself in several ways, and research shows that individuals will defer to a group even when they may know that what they are doing is inaccurate or unethical. Having just one person dissent helps to buffer this effect. The more dependent someone is on you, the more power you have over them. Dependency is increased when you possess something that is considered scarce, important, and nonsubstitutable by others. What does the phrase “Power corrupts and absolute power corrupts absolutely” refer to? What experiences have you had that confirm or refute this assumption? Thinking about the Milgram and Zimbardo studies, do you think you would behave the same or differently in those situations? Why or why not? What lessons can be learned from the past studies of conformity to help avoid abuses of power in the future? Give an example of someone who you are dependent upon. Think about how scarcity, importance, and substitutability affect this dependency.